The Alley Way Stamps: July 2015 Blog Hop: ENTER TO WIN ALL FOUR SETS! Thanks for the chance to win. Love your stamps. What cute and funny faces in the Neener Neener set. I love your stamps and hope to win. Your stamps make a smile on my face. those faces are adorable and i can see so many ways to use them! Cute new sets! Thanks for the giveaway! I especially like the neener neener faces & games! These faces just make me smile out loud!!! Don't own any TAWS stamps yet. Would love to win. I love the funky font on The Alley Way Stamps! i love those cute little faces on that neener neener set. the possibilities! I love the Old School set! I love that it's summer!! WooHoo!! Love the new release. the game pieces are a great idea. the faces will be lots of fun to use. Fabulous new stamps...so much fun! OMG, winner of all set's???!!!!! WOOHOOOOOOOOO that sounds soo good!!! Thank you for the chance and for the No facebooker chance *lol* ;). These ladies did such justice to these new images!! So much talent. I couldn't access a couple of them, but did make the rounds and enjoyed every single one! So excited for the new release! I love TAWS and hops. Thanks so much for the chance to win...I LOVE your stamps! Soooo cute! Can you imagine how fun a kid's b-day card would be full of these sweet little faces? Thanks for sharing Allison! 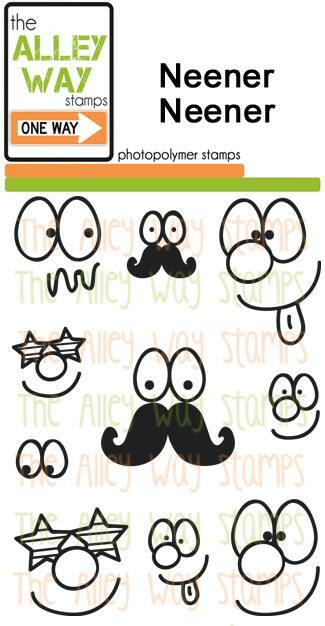 Love The Alley Way stamps!!!! Everything is so cute all the time! And who doesn't love a good blog hop? Such great new sets! Thanks for the chance to win. So many fun new stamps in this release!!! How exciting! Am I being greedy for hoping to win the other three as well? lol Thanks for the giveaway. I'm off to hop! I love your stamps, thanks for the chance to win! Love all your fun stamp sets but my favorite is the Game set with those Pac Man images! Oh my! Your stamps are always so fun. Loving the game pieces...reminds me of my childhood! Thanks for a chance to win! LOVE the Neener set - just awesome! So,SO excited about this release!! WONDERFUL!!! I love your stamps, they're fun and beautiful! These funny faces make me laugh! So cute! I'm REALLY ready to win! These sets would be so welcome at my house!